The official date of adoption of the coat of arms and of the gonfalon are lacking to me. The coat of arms is gules a bend sinister argent and a eight-pointed star of the same in the canton. The gonfalon is blue with the coat of arms in the middle and the words Regione Molise in gold under. The regional law 30 August 1976 decide to create a emblem. The winner was similar emblem as the current one but with three fivepointed stars in the diagonal stripe. But this design was modified and the three stars were supressed. The modified emblem should be added to a blue gonfanon (with the words Regione Molise in the lower part of the embles, in semicircular form) but seems that this gonfanon never was manufactured. 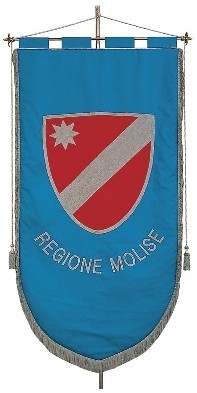 The gonfalone can be seen at <lnx.altromolise.it>: Sky blue field, arms as shown here, and semicircular legend below the arms REGIONE MOLISE in silver letters. Silver fringe. The manufacturer presents one at <www.tecnografica3d.it>.